Techniques by Trish: Scrappy Mom's Terrific Tuesday Challenge!! Scrappy Mom's Terrific Tuesday Challenge!! I want to first thank you all for the get well wishes....they truly mean a lot. I'm still a bit under the weather and now the hubby is catching it so I've been taking care of him as well. I'm sorry that I've been majorly MIA recently. I hope to be back to some type of schedule soon. 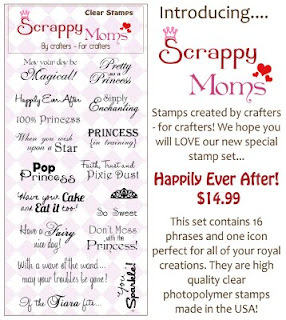 As you know, Scrappy Mom's has released another FABULOUS set called Happily Ever After. Its perfect for any princess :) This is the first time that I'll be showcasing it. The Scrappy Mom Sista's have been showing off the set, so be sure to check out their blogs by clicking on their name in the right sidebar. For today's Terrific Tuesday Challenge, we had to use the Once Upon A Princess Cartridge. My project is very simply and doesn't use the cartridge much. I came up with a little gift box. 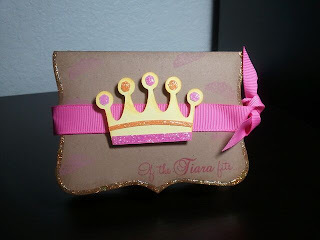 Perfect for perhaps a birthday party as thank you gifts to the princess who joined the party. 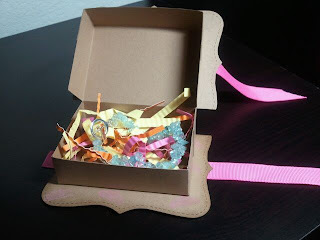 I put in the box a bracelet, just to give you an idea. The idea for the box came from Splitcoast Stampers. Hope you guys enjoyed it! 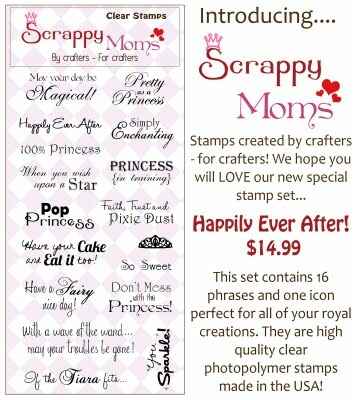 Be sure to check out the other great project at the Scrappy Mom Blog by clicking on the button on the right sidebar. Nice gift box. Thank you for sharing and the inspiration. How cute is that little box! Oh I love it. That is adorable and AMAZING you made it with the top notz.... sooo clever. Thanks for the tips on the embossing folder(s).. they arrived already. I LOVE it.. I am going to make something this week with it. Hope you are feeing yourself soon!